When visiting Douarnenez in Bretagne you will cross on one point the quite high Pont Neuf and inevitably notice hundreds of sailing boats laying lazily left and right down in Port Rhu, one of the 3 harbors of Douarnenez. It´s known for it´s boat cemetery (you will undoubted see wrecks here and there) and the outdoor section of Port Musée. The fishing vessels that are belonging to the museum are up to 100 years old and can be completely explored, even the engine rooms are free for public. The kids had of course a lot of fun; especially our little one couldn’t almost believe that he really could go on a boat, like a real one! The whole vacation he pretended already to be a fishermen running around and yelling in his fake deep grown up voice “je suis un pecheur” … exploring those boats was like a dream coming true. 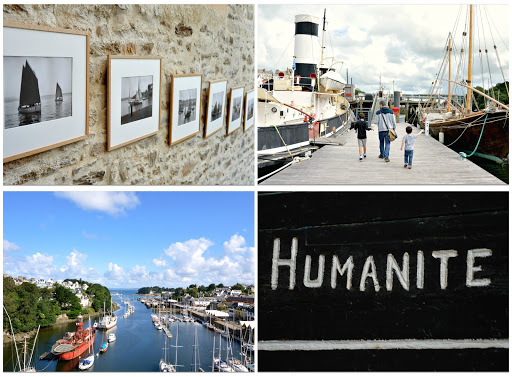 The second section of the Port Musée is just across the street and is a modern museum with exhibits on the sea, fishery, navigation and the history of sardine fishing in Douarnenez.